I had no plans for today. Sunday is such a dead day here it’s hardly worth the effort to try and make plans. During training we occasionally tried to schedule walks along the seawall or dominoes tournaments in the Apia Central courtyard. But making plans for Sunday is an upstream swim, and I think we’ve all accepted the inevitable “if you can’t beat’em, join’em” attitude. My plan for the day was to lie on my couch. My kitchen seemed like a lost cause. I went to Farmer Joe after mass this morning, and they had no wholemeal bread. I’m loyal to the wholemeal, and they said they’d have more tomorrow, so I left breadless. Standing at the bakery counter, I did a mental check on what I could have for dinner now that peanut butter and jelly had fallen through. Oh right. Pumpkin stir-fry. It’s good to have a fall-back. I also had nothing for to’ona’i, the big Sunday brunch, but it’s rare that I have much of a breakfast anyway. But then the day changed. I’ve had a taro thawing in my refrigerator since my sister was here, and I also have an entire jar of pumpkin jelly. I’ve been kinda dying to go back to the Aggie Grey’s to’ona’i buffet after I went with my parents. Among my favorite things there was taro cooked like homefries. So this morning, I figured why not? 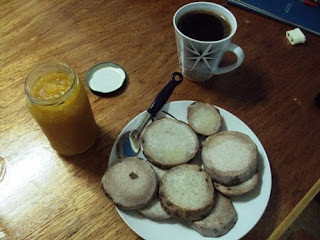 So I sliced the taro into silver dollars, boiled and fried them, and topped them with pumpkin jelly. 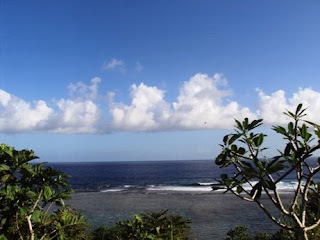 With a cup of Starbucks coffee and last week’s This American Life podcast, it was a delightful to’ona’i. Koa called in the middle of the meal. He and his friend Caroline, who’s visiting from The States, rented a car this morning and wanted to know if I wanted to take a ride around the island. And just like that, I had to’ona’i and plans for Sunday. 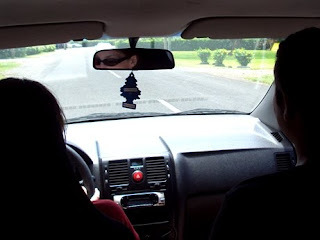 We headed east from Apia, went over the Mafa pass, headed west along the south side of the island, and came back over the cross-island road, stopping whenever we felt the need. I burned a CD while Koa and Caroline were on their way to my house, but it turned out the car only had a cassette deck. And since it was difficult to bring in radio through much of our circuit, we had to rely on conversation. 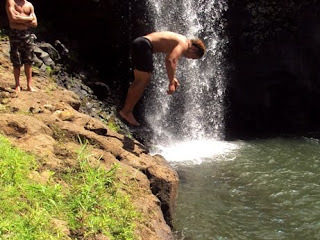 We stopped at the Falefa waterfall where a mute Samoan teenager asked us to take pictures of him doing flips off the rocks. We honored his request. Then it was on to the Mafa pass where we took pictures of the landscape. Then back in the car to Saleapaga where the proprietor of the Faofao Beach Fales allowed us to swim for free. Then on to the waterfall at Papapapaitai. And finally a stop-off at the Baha’i temple at the top of the mountain. The volunteer working there told us we’d missed Paul and his mom by a couple hours. It’s always fun doing tourist things with visitors, and today was no exception. And this on a day I’d planned to spend on the couch. Sweet. I hope you’re well. Pictures will be posted shortly. Pumpkin jam, fried taro, coffee. Clouds off the south shore. Clouds here tend to sit on a straight line parallel to the horizon. Why do they do that? 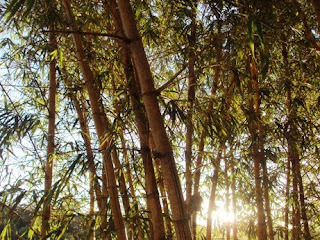 Golden bamboo at the Baha'i temple. I was Googling for the Image of Mary that my fellow Samoans were so fixated on when I came across your blog. I lived there most of my life until I was 17 and then I moved to the states and joined the Army. It's been hilarious reading your blogs and I know exactly what you're talking about and it made miss home. I was drawn to this certain blog because you mentioned Le Mafa Pass. You definitely passed by my house on your way to the Mafa Pass. When standing there and looking down at the beautiful view, I could see my dad's farm. Best of luck and eat a taro for me...it's my favorite!!! i like that horizon picture. it's so peaceful and lovely. you should upload your pictures onto a website (ie snapfish, etc) and print out a photobook. it would make a great collection of your samoa experience.